Redwood Inn Green Bay has been around for quite a few years. It is well known for their Perch Fish Fry along with their Broasted Chicken. The best chicken and perch in Green Bay. Tried a tenderloin steak last time and it was the best - cooked to perfection. Not fancy but great food and service!! Can't beat the Price too!! A Delicious Slice of Life! A true slice of life!! Nothing remotely fancy but the food is delicious. Dined on a weeknight at the smaller location (they serve in two locations-somewhat confusing). Was served a HUGE portion of delicious chicken with fabulous stuffing. Our waitress, Sandy, was very nice and served us a complimentary grasshopper at the end of our meal which was a nice touch. Never fails, the Perch Plate is always the best. Breading is perfect, always hot and comes with coleslaw and two potatoes. It was a Friday, and I had the afternoon and evening free. Since living in the wonderful city of Green Bay, I’ve learned that if you have a Friday night open, you can only do one thing. And that one thing is a Friday fish fry! So, a small group of my friends and I wandered over to the Redwood Inn. The Redwood Inn is located in the Bellevue area and has been graciously serving Green Bay the best perch since, well, since it opened. However, what you may not know is that this place also one of the biggest Packer bars around. No lie. Right when you walk into Redwood Inn, it’s literally Packer, Packer everywhere. 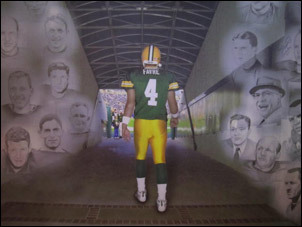 There are loads of pictures, mural type paintings, part of a goal post, and other Packer gear and Packer player memorabilia. Even the bar part of Redwood Inn has quite a few Packer jerseys hanging over it. It’s really quite something to see. And I have been told that a past player or two have been spotted at Redwood Inn getting their Friday fish on. My friends and I sat at one of the high top tables right next to the bar. We went up to the bar and ordered a Bud Light, a Leinie’s Honey, a Leinie’s Amber, and an Absolute and Soda. The total was $13.25. Pretty cheap if you ask me. 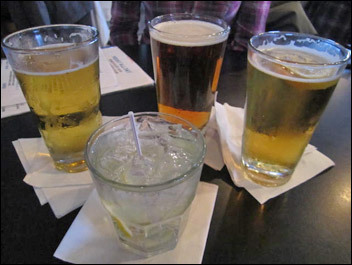 Redwood Inn carries bottled beer, beer on draught, select wine, and every type of hard liquor imaginable. I took note that most people were sippin’ on Old Fashions or soda mixers. Redwood Inn is divided into two parts, the bar side and the dining room side. The bar side is really large. The bar itself is large; it is a very long a narrow bar with plenty of seats. Which, they need, because when we were there, they had a full house. There are also more than a few high top tables surrounding the bar too. The atmosphere at this hotspot is pretty lively; people were drinking and eating, mixing and mingling. I went to dinner at Redwood Inn which is located in Ledgeview on the far East side of Green Bay. The restaurant is updated and immaculate. Redwood Inn is best known for their perch fry and broasted chicken, but they also offer a selection of different items on their menu. The restaurant is very open and has large picture windows that surround it. As soon as you walk in, there is a hostess stand with a cash register and if it is a busy night diners register there. They give you a number and a server will find you and take your order. When your food is ready the server will tell you your table is ready and show you where it is located. To the right of the building there is a very large full bar with an updated countertop. There is also an assortment of cocktail tables to the side. To the left of the bar is the dining area with only a partial lower wall that separates the bar from the dining room. The most outstanding thing that Redwood Inn can boast about is their Packer décor. It is tastefully decorated with the most Packer memorabilia that I have seen in Green Bay and the surrounding area. Not only do they have glass cases of enclosed autographed Packer jerseys but there are authentic items and collectable pictures that surround the interior of the restaurant. 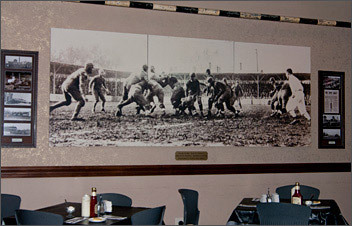 In the dining area, hung high up is a fantastic picture of the old Packer football team in action. Above that is the original metal goal post from the famous 1961 championship game against the New York Giants. I decided to order their lake Perch which includes homemade creamed coleslaw, two slices of rye bread and choice of potato: baked or french fries. Placed on all the tables are one large plastic clear squeeze bottle of their homemade tartar sauce, ketchup, a large slice of whole butter on a plate, a scoop of sour cream in a glass dish, extra napkins and salt and pepper. Once you are seated in the dining room they bring out your food very quickly. The made from scratch coleslaw is served in a medium sized bowl to share country style. When the perch dinner was brought out to me and I was amazed at the abundance of food. 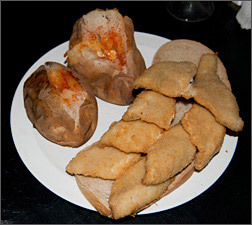 On the bottom of the plate were two slices of rye bread and placed over the bread were three large butterfly perch fillets and to the side was my baked potato. But instead of one potato they serve you two medium sized ones. No going hungry here. Their coleslaw was very tasty and fresh. They shred the cabbage on site and the sauce is also homemade. The perch tasted delicious; very delectable. The fillets were large in size, lightly hand breaded and fried to a light golden color. The fish fillets were thick and moist, not greasy, and the flavor of their homemade breading had a light onion and salt flavor. The baked potatoes were served hot, sliced open with butter and had a very soft texture. If you dine at Redwood on a Wednesday or Thursday they bring you a complimentary dessert, one small cup of mint soft serve which is served in a small Styrofoam cup so it is kept cold. The atmosphere in Redwood Inn is warm and friendly with an amiable and efficient staff. Redwood Inn has many regular patrons and don't be surprised if you happen to see a Packer coach or an old Packer legend who have been known to occasionally patronize the restaurant. Heads up if you plan on dining at Redwood Inn on the weekend for it is very common to have 40 to 60 minute wait.